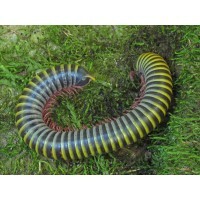 Food: Millipedes feed on fruit, vegetables & leaf litter. 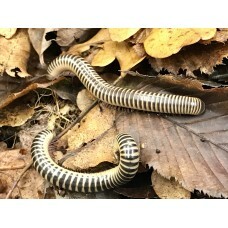 Pretty species of millipede, chocolate brown with ivory stripes along the body. Approximate adult size 7-8cm. I keep my Zebra millipedes in a plastic box but a fish tank would work just as well. I buy the boxes from Wilko or Tesco and make air holes in the lid with a soldering iron, a great little tool for burning the right size holes through plastic. I use peat or coir on the base and add leaf litter (Oak, Beech or other hard woods) and pieces of rotten wood. 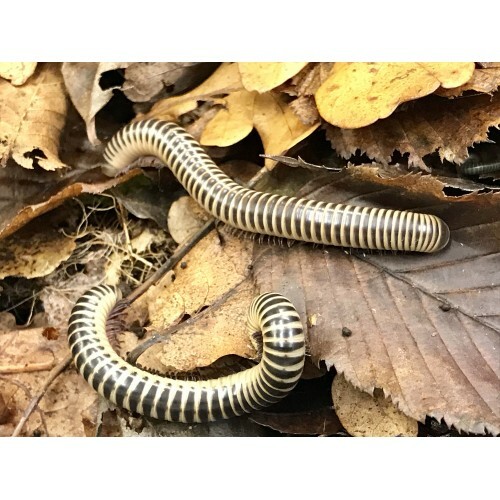 These millipedes seem to eat more of the decaying leaves and wood than fruit/vegetables but I do add a little once a week. 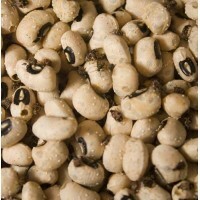 I also add cuttlefish or powdered calcium carbonate occasionally which I am told is good for their growth. 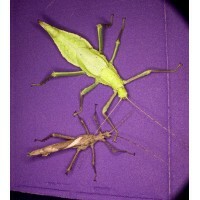 This species is easy to keep, warmth and humidity are important. I use a small heat mat and ensure there is not too much ventilation. If you are housing the millipedes in a fish tank you may need to cover some of the air holes with cling film so that the cage does not dry out. I rarely mist my millipedes as I find they get enough moisture from the leaf litter. 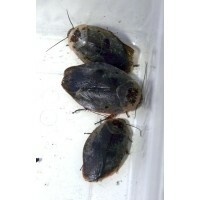 Common Name: Hissing Cockroach Scientific Name: Gromphadorhina species Size: Family Group c.. 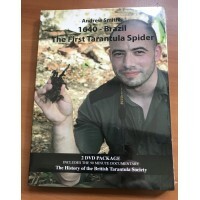 Written and directed by the veteran tarantula researcher/collector/traveller Andrew Smith.Length 105..
Common Name: Bumblebee Millipede Scientific Name: Anadenobolus monilicornis Size:..
Common Name : Jungle Nymph Stick Insect Scientific Name : Heteropteryx dilatata Size : Larg..